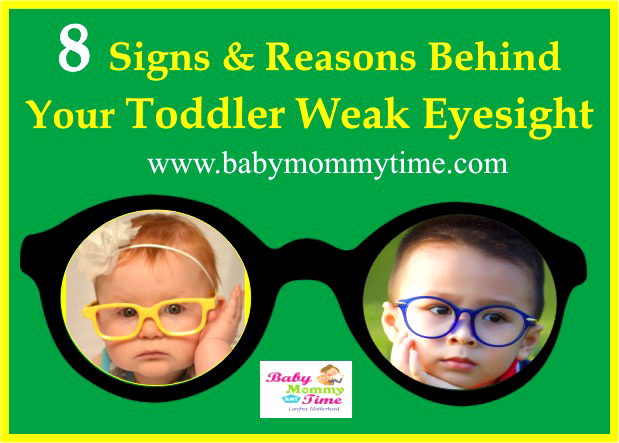 8 Signs & Reasons Behind Your Toddler Weak Eyesight - Babymommytime - Top Blogs on Baby Care, Parenting Tips & Advice. Weak Eyesight is something, which every third child is facing. When we look around us, there are so many kids, who are wearing the glasses. Earlier, the vision problem generally occurs when we are teens or in college. 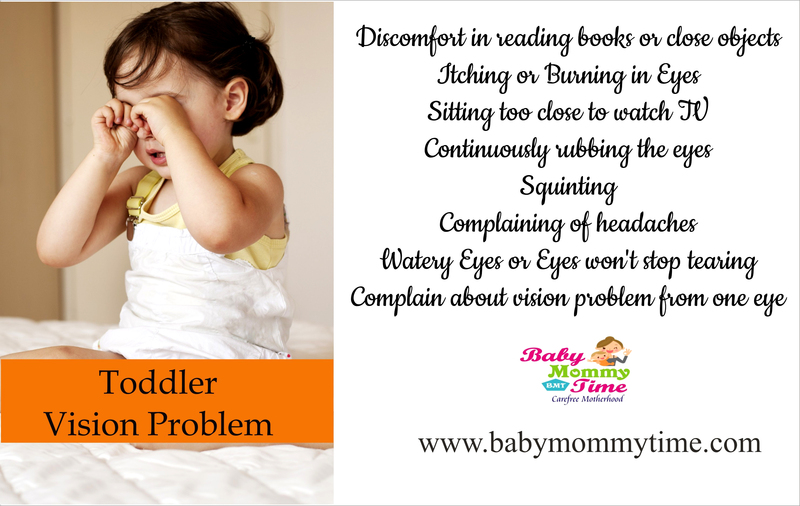 But, these days, vision problem in the toddler is getting very common, which is for sure is not a Good Sign of Parenting. Many Parents, asked this question to themselves, that’s where they have gone wrong in upbringing, their toddler or child, as they have developed the vision problem (weak eyesight). In some cases, its genetic and nowadays major causes behind weak eyesight are due to neglecting from Parents, and especially when we talk about kids of 3 or 4 year. Let’s first find out the reasons, which are causing vision problems (weak eyesight) in toddlers an early age and then the symptoms, which parents can stop, by taking precautions at the right time. Nutrition Deficiency: These days, kids prefer to eat junk foods over healthy foods. Kids have easy access to electronic devices like Mobile Phones, TV, iPad. Get influenced by friends, and people around them. The biggest reason is, these days; parents are over protecting and over loving towards their kids. If, suddenly, you notice that your Toddler is avoiding reading books or are unable to pick up the close toys and other objects. Plus, they are irritable and frustrated and using fingers to read the lines from books. Then, maybe it’s a sign that you need to get your toddler’s eyes to get checked. Sometimes, your toddler will complain about itching or burning in their eyes, which some parents generally neglect or avoid. As, Parents get confused and thought that maybe kid haven’t slept well or due to pollution in the air, their toddler is complaining. But, many parents don’t know that itching and burning in eyes are the first sign and symptoms of weak eyesight in kids. Therefore, start taking the precaution as soon as, you identify any signs of vision problems in your child. Every child, love to watch TV from close and at high volume (loud), which is seriously not understandable. But, Parents should discourage their toddlers, to watch tv from close and keep an eye on their kids. Parents should try to get their child involved in indoor games and buy some good toys to entertain them at home. Make a schedule of watching the TV, and tell your toddler to follow it. It’s you, who can save their child eyesights. If, you notice that your toddler has started rubbing his or her eyes in a short duration or time, and having a problem in reading things. Or, every morning, after for toddler gets up, he starts rubbing his eyes too much and continues the same. Maybe, you will notice Red Eyes too, please take your toddler for an eye check-up. Your toddler will start complaining about not seeing the objects well far away. Like, he will not able to tell how many birds in the sky, or cars parked in front of him or her. Having a problem in calculating the things which are far away. In case, your child is complaining about frequent headaches in the forehead or temples, and then differently it’s a vision problem. Headache is the most obvious sign in adults and kids of having a vision problem. Normally, we think that watery eyes or tear come, when kids have allergies; infections like a cold; or pinkeye. But, watery eye or unwanted tear can be a sign of vision problems. This is something, which is unnoticeable and parents aren’t able to figure out the vision problems in their child. But, the biggest question is, how parents will get to know about this sign. Therefore, in small intervals keep checking your toddler’s eyes, by playing one eye game. Tell your child to close one eye at the time, and read from the other eye. This will help you know his or her vision condition. Like other parents, don’t wait for this sign and take precaution beforehand. Always, ask your toddler to It’s a sign, which Favors the use of one eye when reading or viewing an object, Experiences problems catching a ball.